Few days' break from blogging and outfit instagramming because I wasn't feeling like myself. I'm still a bit fluish, but getting better by the hour. Although, that's not the only thing going wrong this week, today my car wouldn't start because it's so cold and I think the battery doesn't love it's life. But hey, nowhere but up from here. Right? Okay, that's how my week has started which feels, dare I say, messy. But at least our walk-in closet isn't that anymore! Which is what I quickly want to talk about today. So right from the bat you can see the awful mess that our closet was. 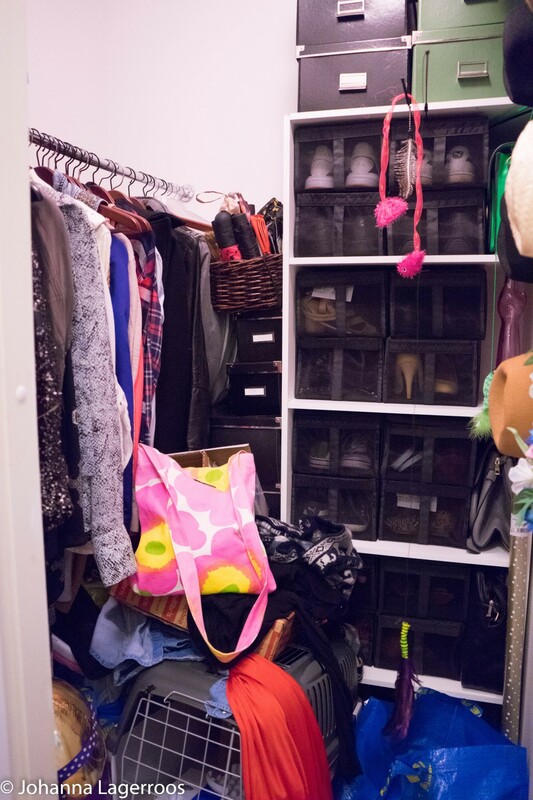 This was a dreaded area for me that I just refused to deal with before figuring out the best storage system for us. The closet was a mess ever since the move because it was convenient just place things there, shut the door and not really think about it too much. And look how well that turned out. Like you can see, we had bags, boxes, random clothes and so on there - most of it being my mess to be honest, but also cat toys and more. You can probably understand why I would just rather forgot this than to face it head on. 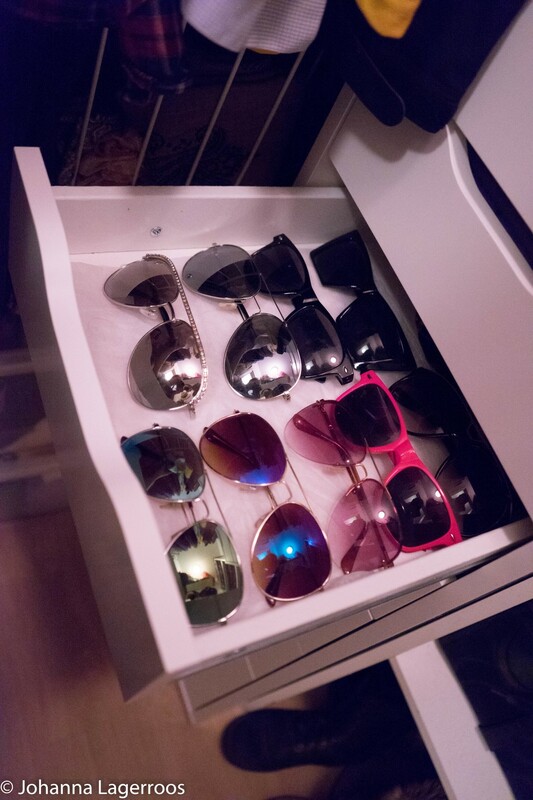 But couple of weeks ago, we looked at Ikea's website and found this narrow drawer Alex (which I feel every beauty blogger/vlogger had at some point and maybe even now). 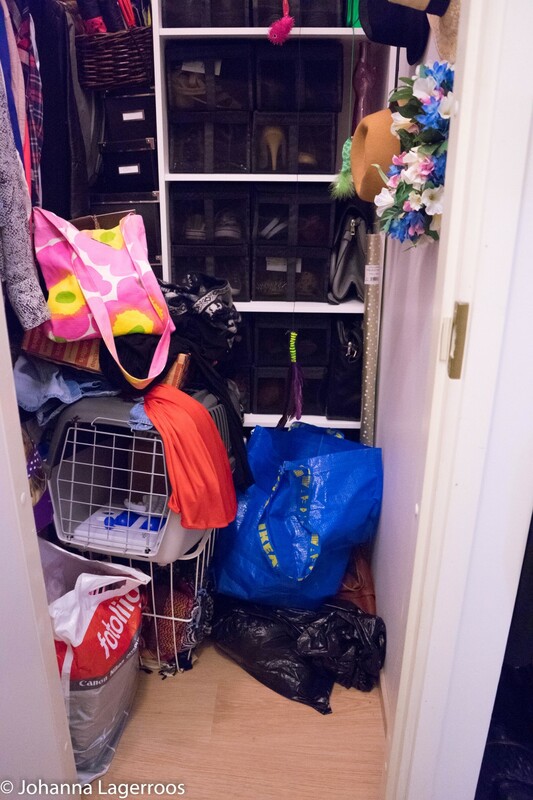 We measured the closet and figured it would be quite perfect for our closet. So we went and got the drawer on a Thursday, and when I came home from work the next day my boyfriend had assembled it for me - therefore all I had to do was to clean and rearrange the closet. Which to many sounds like the most boring Friday night but it was so good for my mental health. I'm happiest, least stressed and most focused when my home is in order. I feel that's something I've neglected in the past too much, but through decluttering, watching minimalism videos on YouTube and Marie Kondo's Netflix series, I've found that my mind actually benefits a lot from having as organized home as I can and having only things that bring value to my life. 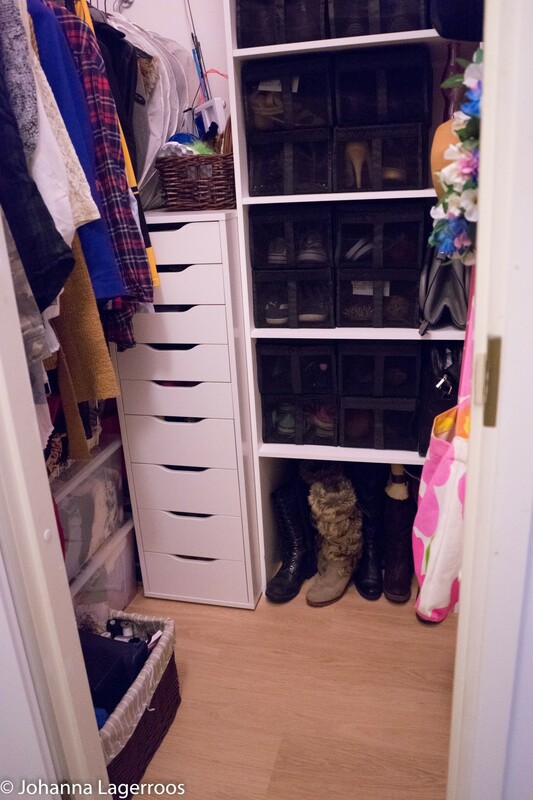 This is how the organized closet looks, it's so much better and everything can actually be reached, which is good. 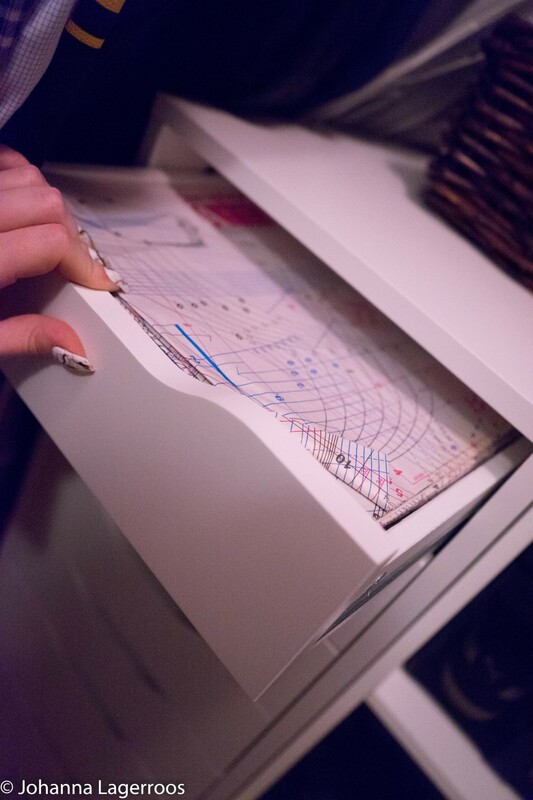 Below, I will show you some of the drawers, into which I emptied out most of the boxes you maybe saw next to the shelf in the first two pics. While I like storing things in boxes, it's very impractical unless you can store them so that not more than two are on top of each other. Having to lift five boxes to get to the one you need is not a motivating workout like I thought before. It actually makes you not use the things that are not easily reached, and once you manage to motivate yourself to use those items, you get upset by having to lift the boxes back and forth. Well, at least that's how I experienced it. Now, I feel like the items are easy to find and reach, and I know that even my boyfriend can find anything here. Or the friends that visit - not that there are many things any of them would need but still. 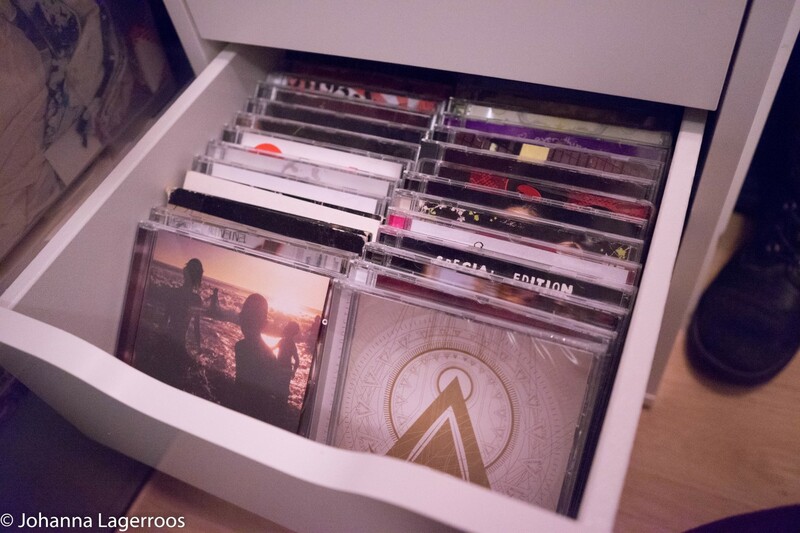 Like I said, I'm sharing some of the organized drawers here, I don't think sharing each provides added value to you but seeing some gives you an idea how nicely the Alex drawer works for our space and needs. 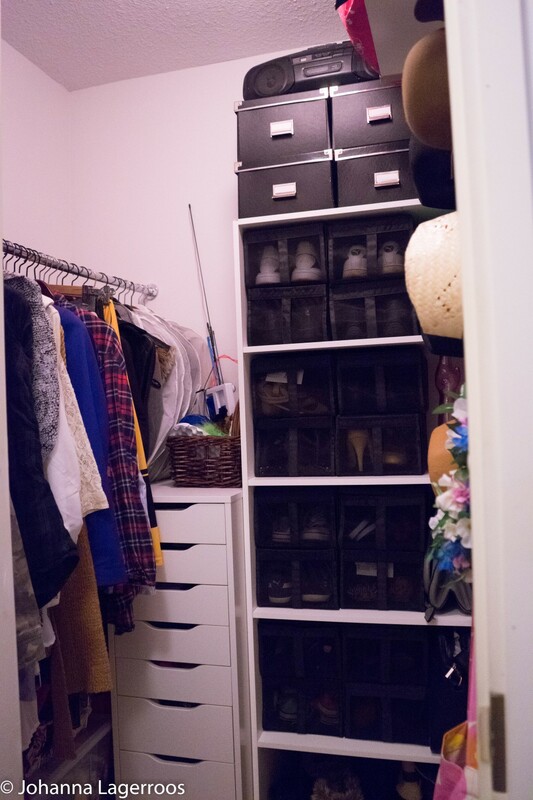 What do you think about the closet transformation? 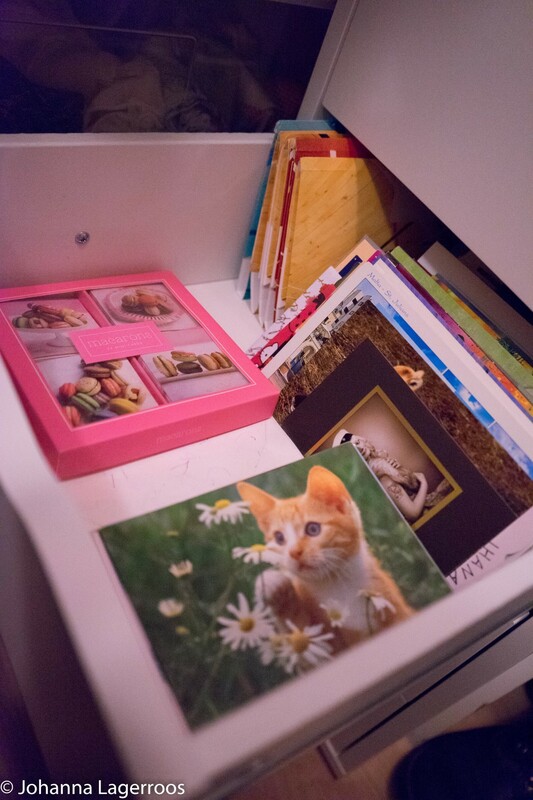 And, have you rearranged/decluttered to welcome the new year? Let me know in the comments! That's all for today, but I'll be back soon with another style related post. 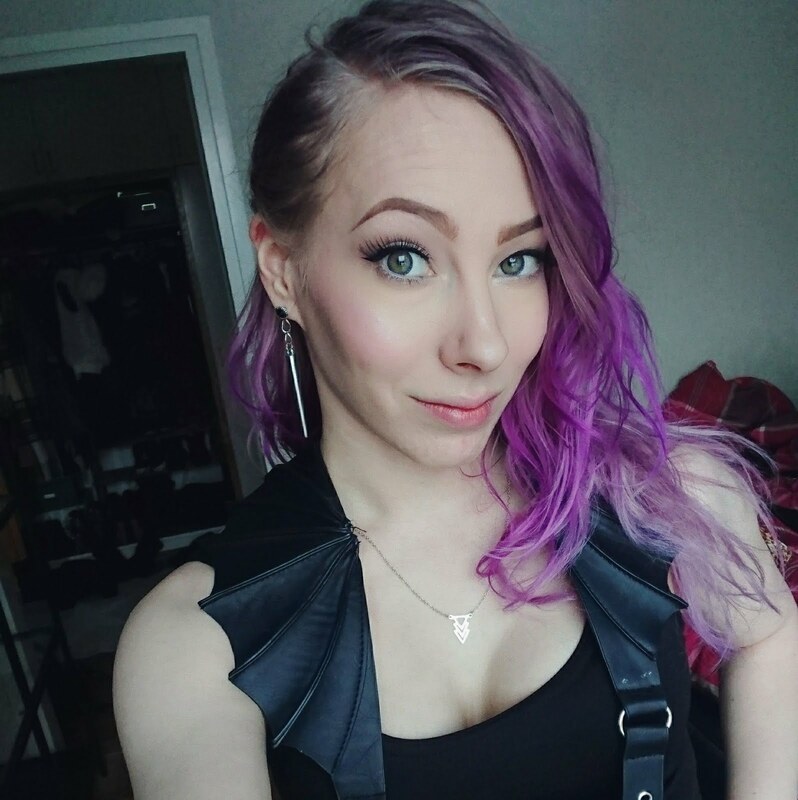 It'll either be styling a trend or DIYing a band tee, but I'm not entirely sure which I want to post next. You'll find that out in the next post! In the meantime, check out my Instagram (@silvertigo) for daily outfits and more. I'll see you in my next post! ahhhh! everything so organized is just so satisfying to look at. Good on you taking that challenge!